Ka-tropa, hanap mo ba ay sulit na combo at may unli FB? Sa Talk N Text, may unlitext ka na, may call at Unli FB pa! New from Talk N Text, GAAN UNLITEXTPLUS 15. 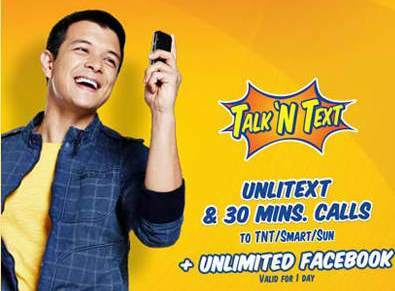 Very affordable promo offer that gives you unlimited text to TNT, SMART and SUN friends with 30 minutes worth of calls to TNT, SMART and SUN plus unlimited Facebook access valid for 1 day! Update your status, like and share stories, send text and call anytime, anywhere you want. dial *121# and choose GAAN UNLITEXTPLUS 15 for FREE! This promo is available and valid to all Talk N Text subscribers nationwide.